If you’re a regular viewer of The Chase, you’re bound to know that each of the Chasers that contestants are forced to battle have their own unique nicknames. Due to his larger frame, Mark Labbett is known as ‘The Beast’ and Anne Hegarty is referred to as ‘The Governess’ due to her headmistress-type demeanour and dress sense. You also may recall sarcastic Paul Sinha known as ‘The Sinnerman’ and retro-styled red-haired Jenny ‘The Vixen’ Ryan. However, it’s recently been shared online that the Austrailian version of The Chase has made a significant change which some have claimed to be a race issue. Shaun Wallace a.k.a ‘The Dark Destroyer’ joined the Aussie series at the beginning of 2018, however, many have been left furious by the show’s choice to adapt Shaun’s iconic stage name. Instead of being named as ‘The Dark Destroyer’, as he is known in the UK, the Austrailian series simply labels him as ‘The Destroyer’, therefore many have been left wondering whether they are aiming to skip the reference to skin colour. Is this political correctness overstepping the line? Many Twitter users believe so. ‘Any particular reason why @THECHASEAUS refers to Shaun as just ‘The Destroyer’ when we all know him as The Dark Destroyer on the UK version?’ one Twitter user wrote. ‘Can’t believe they’ve changed The Dark Destroyer’s name on the Chase to just ‘The Destroyer’ WORLD’S GONE MAD I TELL YA BLOODY MAD.’ another added. While many were furious by the name change, others were convinced the name had intentions of referring to his race, with concerns it is highly inappropriate and shouldn’t have been given the go-ahead by ITV. 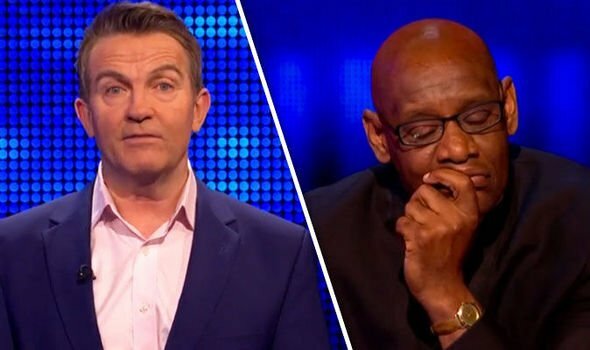 ‘I cannot be the only person that thinks ‘The Dark Destroyer’ is a racist nickname for Shaun Wallace, on The Chase.’ one viewer wrote online. ‘When are ITV going to realise calling a black man ‘The Dark Destroyer’ is a little bit racist?’ another added. ‘Is it not a little bit racist that Sean on the chase is called the dark destroyer’ another commented. Even Bradley Walsh landed himself in a spot of trouble after making a racist joke during the filming of one particular episode. He said: “You know what I’ve wondered about [The Dark Destroyer]? You know when he’s washing his face, how does he know when to stop?”. Shaun seems to be thrilled by the new venture down-under though and is ready to challenge some of Austrailia’s brightest sparks. Back on @ITVChase now on @ITV! “I’ve heard stories from the Governess and the Beast about how well the Australian contestants perform. It’s about time I see them in action for myself,” Wallace said. “I’ve dreamt about travelling Down Under, and I am so excited to finally have the chance and be a part of The Chase Australia. I’ll be brushing up on my Aussie slang and history. Get ready, Australia, the Destroyer is coming.” he said. The Chase isn’t the only show Shaun has appeared on to showcase his large span of knowledge. He joined the team at ITV back in 2009, however, previously appeared on shows such as Mastermind, Fifteen to One, The Weakest Link, Greed, and Are You an Egghead? Na, im sorry but Shaun Wallace from the Chase gettin told to change his own nickname from the Dark Destroyer because ppl are fonin in offended is too much..fukin hell the worse it gets ? Although Shaun is up for the new career venture, he frequently comes under fire from viewers for his poor performances during the final chase. On one particular episode, viewers flooded to Twitter to slam The Dark Destroyer for failing to answer a long line of questions correctly. The team were playing for a beatable £14,000. Firstly, he believed the brand Butterkist was a type of biscuit rather than popcorn and muddled up an easy answer when it came to naming a film director. Due to missing out on six questions, the team went on to score by correctly answering a number of pushbacks; eventually bagging the prize fund and splitting it between them. Fans of the show were gobsmacked by the failure to beat the team, with many claiming that it was about time Shaun ‘retired’ from the show altogether. “Shaun is useless, easy win again for the team. A s*** chaser. one user said. “The teams must rub their hands with glee when they reveal the chaser as Shaun.” another commented. “When is The Chase gunna sack Shaun Wallace” another Tweeter asked. Another added: “Another thrilling game Shaun Wallace always gives you chances”. Meanwhile, the show has also been branded as a ‘fix’ by some viewers who believed that Mark Labett a.k.a ‘The Beast’ is always on top form when big money is involved. The team consisted of student James, 26, Logistics coordinator Robyn, 40, and retired civil servant Martin, who all aimed to win the huge £60,000 prize fund. The three-man team only managed to answer 18 answers correctly, however, The Beast didn’t even give the contestants much of a chance after answering all eighteen questions without hesitation. “Biggest fix on television #TheChase.” one user said in regard to The Beast’s success. Another viewer went on to say: “This show is a joke now. Scrap it ITV #TheChase #FixedForTheChaser” another viewer said.